All models stuck together with other items. Had to rearrange every time I wanted to store something inside. No more! Now I added a new Detolf next to it. That’s what I like about IKEA, once you get something from them it’s easy to follow the theme since they rarely change their designs. 5 years apart and they still sell Detolfs. Now that the models are separate, they stand out a lot more. And I thought hey, since I have a second cabinet I might pimp this up a little. So got the fitting LED lighting system for the shelf. Turns out all spots in one cabinet is way too much lighting, so I divided the 4 lamps evenly on two cabinets. The lamps are pretty flat and have 2-sided adhesives that allow sticking on the wooden ceiling of the cabinets. Good for me since I’d like to hide the “infrastructure” whenever possible. Of course those who are good with woodwork are welcome to carve out spots for the lights and tunnel out for the cabling but I’m both lazy and terrible when it comes to such heavy modification. Let there be light! I’ll try to hide away the hideous cabling in the back some other time, but for now it works pretty well I think. The top shelf gets the cake in terms of lighting, but that’s something I can live with. By the second row there’s significantly less light already. 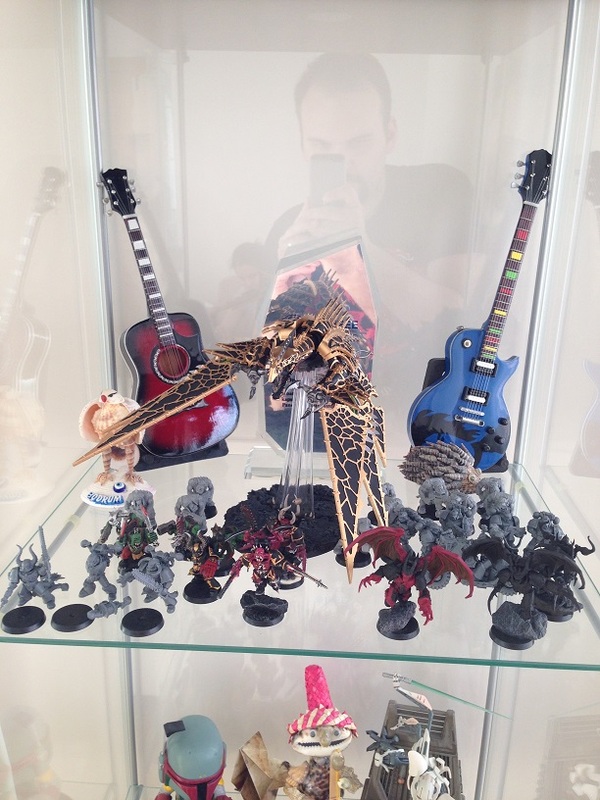 Good place to store WIPs and other stuff (like the orks that got no love). Took a good part of the Sunday but I think I’ve saved a lot more time spent rearranging stuff in the one display case by getting this solution. 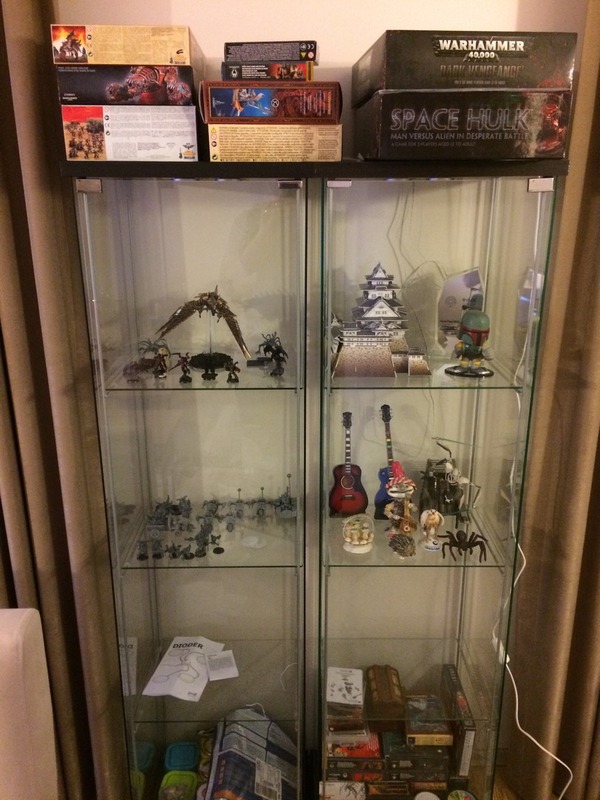 The retail price for the cabinet is ₺230.00 (about $100.00. I guess I’ll never get used to that Turkish Lira sign…) and the lighting is ₺30.00 (~$15.00) each, sold in a 4-pack. Not the cheapest solution out there but it’s the one that works well for me. For those who use lighter color displays I recommend getting LED strips that run across either the sides (not an option for me, Detolf is all glass all around) or the top of shelves to get a nice, daylight solution. 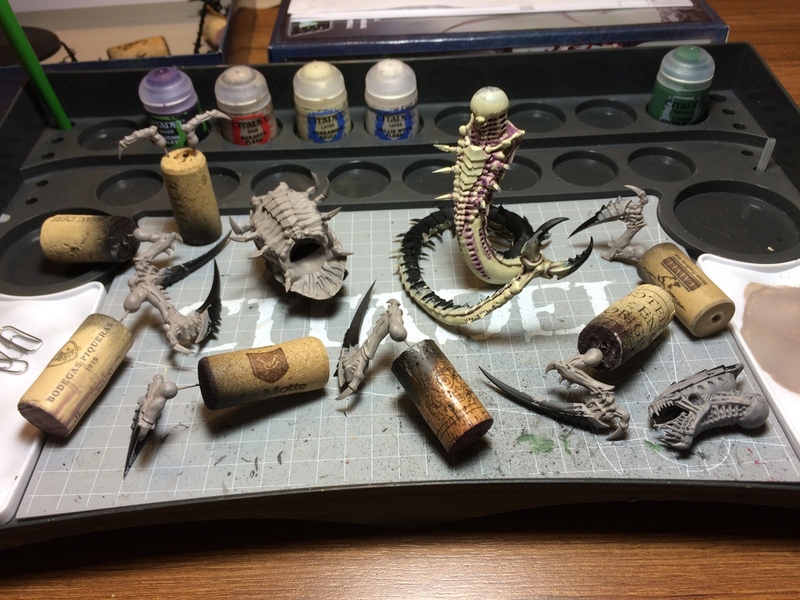 I shouldn’t discourage myself by saying I’ve done nothing on the hobby front. I did get some basecoats done! At least I’ll see progress on my work station when I return from my business trip on Thursday. Next weekend we’ll get a chance to meet my wife’s uncle who’s visiting us from Scotland, and guess what, he was kind enough to bear all the stuff I’d ordered through the GW online shop! So next week there’ll be a few more review posts for the goodies in transit. Hopefully I’ll be able to work a little on the kits on Thursday to have a small update on Friday… let’s see how it goes. No need to be secretive, it’s the Deathstorm pack and the new project box. Feeling hyped about both as one has many minis for me to paint and the other will be a solution for my storage problems! 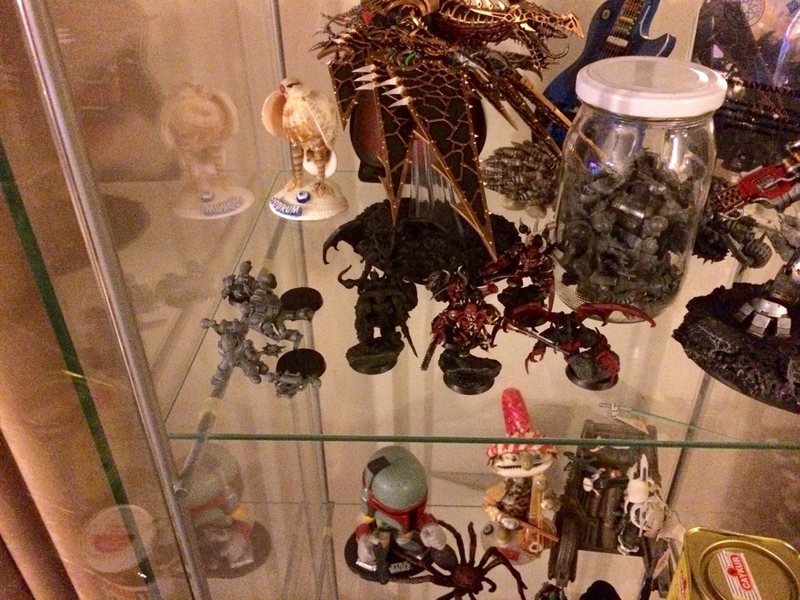 I swear, almost every blogger I’ve checked on the internet uses either a Detolf cabinet or a Tertial lamp or both! Handy stuff, what can I say? I think us bloggers are a friendly sort, who tend to be more willing to take advice that is given. Thus there is quite a lot of duplication of all the good stuff. I have not seen a cabinet that even comes close to the pricing of those detolfs. In the states, they are 65 USD. The closest priced cabinet I’ve found outside of ikea (of similar design) if about 4x as much!. That lamp is pretty awesome too, just because it diffuses the light as well. I’m having an issue with my center bulb, and someone suggested replacing that one with a 3500K bulb to add some warmth to the cool blues. Will see how that goes. Very cool setup. The arrangement looks much better now and the minis can indeed shine. Did you consider making some themed presentation insets for your case? Could end up as a number of mini Dioramas. That is actually a great idea and my wife mentioned this too. Perhaps when I get more demon done for the cabinet I’ll add some hellish landscapes underneath with a nice background photo to represent it. For now I’ll be content with the way they stand… but it will definitely be a nice project to look forward to!